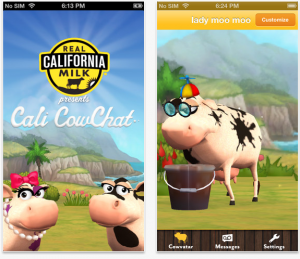 With Cali CowChat, you can personalize and add accessories to your cowvatar – who can tap dance and sing – and then record and send voice messages to your friends. The app lets you change the cow’s color, features and the shape of its spots, and add accessories. Users can also interact with their cows by milking them, shaking them up to make them dizzy, tickling them (really!) and moving them around the screen. When the recipient opens your message, your personalized California cow appears on their phone and speaks in the animated California cow voice. Real California Milk has 220,000 likes on Facebook; @RealCalifMilk has 2,100 followers. Cali CowChat is the second app from the California Milk Advisory Board. The Real California Cheese Pair Savvy app launched in December 2010 to offer ideas for paring California cheeses with wine, beer and chocolate. California Department of Food and Agriculture funds CMAB, which executes advertising, PR, research and retail and foodservice promotional programs on behalf of California dairy products.